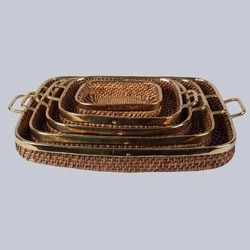 Size/Dimension: 5", 8", 10", 12", 14"
We are offering Square Wicker Tray. Suitable for various special occasions, our array of stainless steel Square Serving Trays perfectly crafted by the team of experienced designers. The high grade stainless steel used for designing this range makes its long lasting and superior in finish. Moreover, our entire range of square serving trays is easy to clean and can be availed at reasonable prices. Diamond beaded square tray for serving. Dimens 15.0 In. X 15.0 In. X 2.5 In.